If you’ve never tried Saltine Toffee, now is the time! 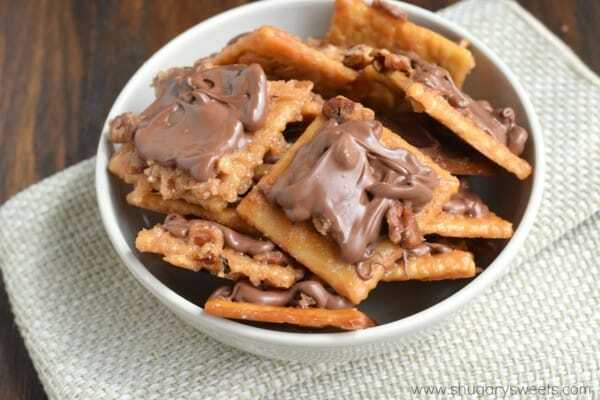 Crispy, buttery toffee with crackers, pecans and chocolate. So easy to make, too! Years ago I remember being at a family reunion and I tried a graham cracker toffee bar. It was amazing and delicious, and I was SHOCKED that the base was a graham cracker. I had to keep eating, bar after bar, for taste testing purposes. Years later I shared the recipe for those Brickle Bars on my blog. They are still one of our family’s favorite treats. And they are so easy too. From the time I start making them until the time I eat them it’s less than half an hour! A big plate of those bars goes fast with my family. 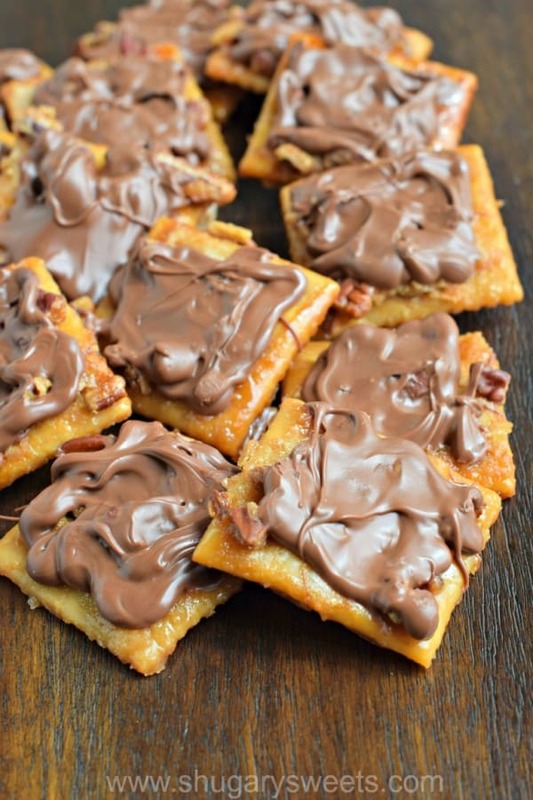 Recently as I was perusing Pinterest, I saw a photo for “SALTINE CRACKER TOFFEE.” My mouth gaped open (seriously). Why had I not thought to make my brickle bars with saltines??? Well my friends, today, it has happened. I am happy to say the brickle bars can now be made using saltines. And the result is amazing. This Saltine Toffee recipe has a saltier base (DUH) than a graham cracker, so the sweet and salty combo shines through on these bars! Making this saltine cracker toffee recipe is really easy. To start, melt your butter in a pan, then add your sugar. Bring this mixture to a rolling boil. Line 40 saltine crackers on a 15 x 10 x 1-inch baking sheet. Pour the melted butter and sugar mixture over the crackers, slowly, making sure that all the crackers have been covered in butter. You want all that buttery goodness in your Saltine Toffee! Sprinkle everything generously with chopped pecans, then bake this for about 15 minutes. You want to make sure that the crackers look brown and caramelized. Use a small spatula to remove the hot saltine cracker toffee from the pan and place it on parchment paper (or wax paper). Melt your chocolate chips and spread over each cracker. 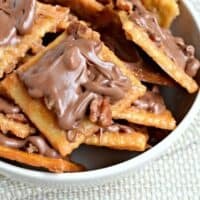 To make this easier, I pour my melted chocolate into a large Ziploc bag, then snip the corner and drizzle generously over each cracker. Works like a charm! Once the chocolate has hardened, store Saltine Toffee in an airtight container at room temperature for up to 5 days (if it lasts that long). ENJOY! Make a version of this saltine toffee, aka Christmas Crack for the holidays! Topped with white chocolate and festive sprinkles it will disappear fast! S’mores Cracker Toffee is layers of graham cracker toffee, marshmallows, and chocolate. What more could you want in life? This Peppermint Cracker Toffee is ridiculously easy and delicious. Crisp, buttery toffee topped with white chocolate and peppermint candy, the perfect Christmas candy treat! Peanut Butter Cracker Toffee will be your new favorite sweet treat. It’s so simple to make, and it’s downright trouble too with its addictive peanut butter flavor! 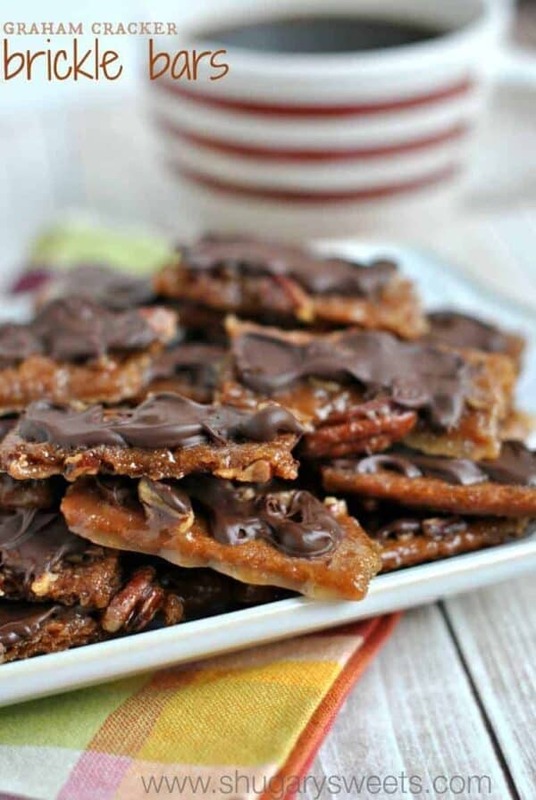 No crackers needed for this crispy delicious Buttercrunch Toffee recipe from The Noshery! Almond Club Cracker Toffee recipe from Wishes and Dishes is salty crackers coated in a sweet toffee sauce and slathered with almonds. This will be your new favorite easy holiday go-to treat! If you've never tried Saltine Toffee, now is the time! 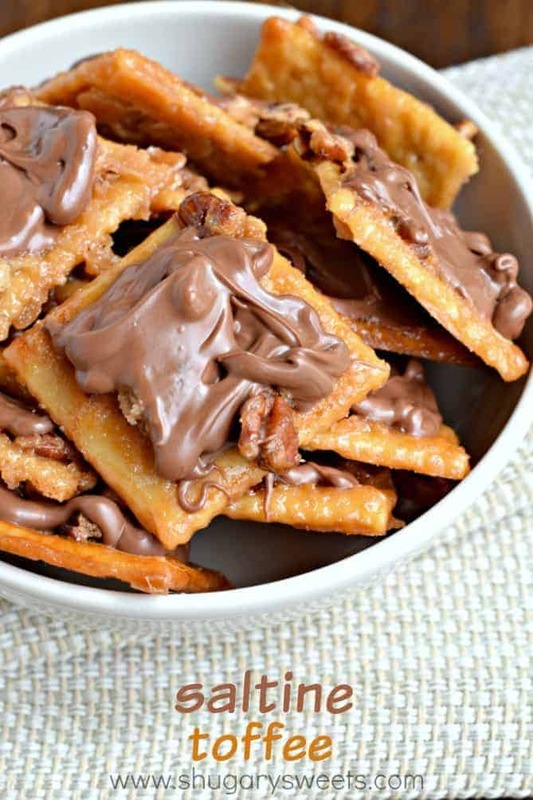 Crispy, buttery, toffee with crackers, pecans and chocolate. So easy to make, too! Pour over saltine crackers and sprinkle with chopped pecans. Place in a 375°F oven for about 13-15 minutes, until crackers are browned and caramelized. Melt chocolate morsels and spread generously over toffee. Allow chocolate to set and store in airtight container for up to 5 days. *Today’s recipe for Saltine Toffee was originally published on Shugary Sweets on June 10, 2015 and has been republished in November 2018. The salty/sweet goodness here? It’s OUT OF CONTROL. I grew up on saltines with chicken soup…but I think Imma like it much better this way 😉 Pinned! A student made me these once and they are CRACK. Forget taste-testing. I will eat the whole dang batch without any qualms. Yours looks incredible! It’s been so long since I’ve had saltine toffee! It’s a family favorite around here! I love saltine toffee way more than any other, except maybe matzo. These look so good and perfect! Oh dear this can not come into my house or I will devour the WHOLE batch without a doubt! The BEST idea ever! Saltine toffee is one of my favorite things and this looks even better! I love this kind of toffee! Pinning! I’ve never tried saltine toffee before but it looks AMAZING. I make these almost every Christmas time, several batches, and they are deadly. I can’t stop eating them. Definitely addicting. I would LOVE to make these but have a question…..there is no mention of spraying cookie sheet with PAM or anything…..will the crackers not stick to the pan, being the butter/sugar is so sticky and basically caramelizes? That’s why I remove them from the pan immediately. Before they begin to harden. I use a small spatula (a knife would work too) to slide them up and onto parchment paper. “Why had I not thought to make my brickle bars with saltines?”, you ask. Well, the answer is quite obvious: you’re a pack-follower, and not able or willing to think originally. It’s the same condition that results in you using outdated idioms that actually mean the opposite of your intention (i.e. “works like a charm” – given modern beliefs in the effectiveness of magic, just what are you trying to say here?). And you stopped by my blog why? To be rude? Keep on trolling…. I have a similar recipe that calls for “club crackers” without the chocolate and everyone LOVES them. I’ll have to try these, thank you for sharing. I remember having a similar reaction to a similar treat, with a saltine cracker base, at the home of a friend who is of Mennonite heritage. Too good! I made these tonight, very tasty. The next time I will add a dash of sea salt on top! Thanks Mischell. Love the idea of sea salt on top! Back in the 50’s when I was a kid. We were pretty poor. 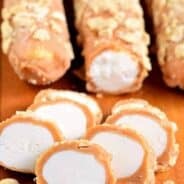 And our favorite treat was when my Mom made something similar to this. Back then crackers came in a square of a crackers. Mom would line a cookie sheet and make her homemade fudge. When just at the right stage, she would pour over the crackers. Then top with another one. When we came home from school and saw these on the table, we thought we were the richest kids in town I can still taste the salty and sweet snack. I have retried but have never been able to get my fudge like hers. I am sure she had a secret. Most of her recipes were never wrote down, and if they did it was a pinch of this or that, lol That’s the way her famous chocolate pie was too. She made the pudding in a cast iron skillet. Bless her soul. works great with club crackers. 1) How long do you cook it after it comes to a rolling boi?? Once it begins to boil, it’s done. And the directions indicate baking for 13-15 minutes. Enjoy! The even quicker way is to leave crackers in the pan, turn off oven, spread un-melted chips evenly across, place back in oven for 3-5 mins to melt using leftover heat, remove, spread with spatula, then top with nuts, toasted coconut, a dried fruit/nut mix, etc. Let cool and break apart. I line my pan with parchment paper so I can lift entire batch out at one time. I love toffee! Question though….do you bake these until the butter/sugar mixture is drunchy (dry) or do you still take them out of the oven if it still *looks* wet? I’m sure that’s a dumb question, but thought I’d ask anyway, since I really don’t know! Oh, and one more question. I noticed you use granulated sugar instead of brown sugar. Do you know if there’s a difference in flavor, texture….or whatnot….between the two? I bake and take them out while still “wet.” They will harden within a few minutes which is why I work fast to get them onto parchment paper. Some people have commented that they use brown sugar, I’m sure that tastes lovely too! We called these “cracker bars” when I was growing up…. sooooooo good!!!! I love your tip to take them out and let them cool on parchment paper. We let them cool in the pan (after “frosting” them with the chocolate) and it was such a pain to cut or break them into squares! I’ve never heard of these !.. 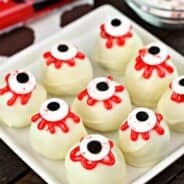 they look delish !… I will be making them this weekend …..
I’ve made these before after trying them and getting the recipe from a friend at work. You don’t have to go through the extra step and trouble of frosting with a ziplock bag. Our recipe just has you dump a load of chocolate chips onto the hot toffee saltines and, after letting them melt a few seconds, spread. When it cools, break apart into pieces like you would break candy bark. Try moving the oven rack up a notch and see if that helps! How long do you boil the butter and sugar? These are awesome using club crackers! I have never tried the chocolate, but if I did I would just drizzle with a fork….let the chocolate run down of a fork and just kind of move it back and forth that way there isn’t too much chocolate. The butter and nut crunch alone make these worth making! Or you could put the chocolate in a ziploc bag, snip off the corner and drizzle it on 🙂 ENJOY!! I could even omit the chocolate on top to make a treat my dad, who can’t eat chocolate, could enjoy. you don’t need to put the choc. on after. Just pour it over the hot crackers, wait a few minutes and then smooth. I never take them out of the pan ahead either. They snap out when cooled well. As the choc. starts to harden again, I will cut along between the crackers and then it cuts in squares easier when well cooled. These sound amazing. Going to try them this weekend with the family. I recently “created/modified” a bread pudding recipe (sweet potato/pecan pie bread pudding) and found a separate recipe for a whiskey sauce. I substituted the whiskey with rum and butter shots —Oh My Goodness!!! I’ll bet a little bit of butter shots would be heavenly in this recipe too. Gonna try it tomorrow!! I just made these for the first time, and I burned them! Full disclosure- I’m not very good at baking. I’m disappointed, but will try again another day. Any suggestions for next time? Definitely check and make sure your oven temperature is correct. I highly recommend using an oven thermometer. My ovens in the past have never been exactly what they say they are supposed to be! Is there any way to make these further in advance? Have you tried freezing them? Freezing crackers doesn’t seem ideal, but I would love to make some tonight for Christmas weekend (more than 5 days) and for New Years weekend (way more than 5!). Thanks for the help!! One recipe says to stir boiling sugar/butter vigorously, one says do not stir one it boils. If the butter separates can hot water help to blend it in? Toffee seems daunting to make properly! My daughter has a severe allergy to all nuts (peanuts, tree nuts…all) I’m always trying to find new & delicious treats for her because there’s so much she can’t have. What do you think of the idea of substituting broken up pretzels for the pecans? I would greatly appreciate your opinion Aimee! I will try to make this for my kids, they will love it very much because they look so yummy. Thank you so much for sharing this recipe! Who said I don’t want it! It’s very dangerously delicious! How a fantastic recipe! I must give it a try soon! Um, YUM! So quick and easy to make, and would be great to make for last minute company, thanks for sharing! This recipe look very delicous ! This recipe looks very delicious. I will try it soon. Thank for share here ! I’ve never tried saltine toffee before but I will on this weekend. I will make it for my kids. Recipe hard to find or get ,need to post under picture of item . I’m not very good at finding things. 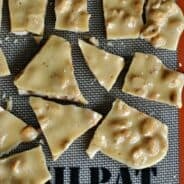 I still haven’t gotten around to making my own saltine toffee ! I really need to get on it! I was thought it is not easy to make this recipe, but now, thank to your post, I think I can do it more easily. These look delicious and definitely not on the diet. But who cares about the diet when you can have these yummy saltine toffee crackers? Very tasty!, I want try it but I don’t. If I have opportunity will try. I must have done something very wrong. I was so disappointed with the way these turned out after reading all the five star reviews. It tasted and looked just like a saltine cracker with chocolate and nuts on top. If they are done right, are you supposed to recognize the cracker on the bottom? Mine looked like a saltine cracker with all its little holes and ridge edges. What did I do wrong? I don’t think I’ll waste the butter, chocolate and especially the nuts on these again. Sounds like something went wrong, because it definitely doesn’t taste like a cracker…it tastes like toffee! That sounds good. It take only half an hour to make Saltine Toffee, right? I will try. I’ve made these before after trying them and getting the recipe from a friend at work. You don’t have to go through the extra step and trouble of frosting with a ziplock bag. Where is the recipe? I’ve looked for over an hour & don’t see anywhere how much of anything to use except 40 crackers, butter & sugar – really aggravating that you promote this but don’t list the ingredients & their quantities . Carl Schwartz posted JUNE 17, 2015 at 11:24 AM	REPLY “Why had I not thought to make my brickle bars with saltines?”, you ask. Well, the answer is quite obvious: you’re a pack-follower, and not able or willing to think originally. It’s the same condition that results in you using outdated idioms that actually mean the opposite of your intention (i.e. “works like a charm” – given modern beliefs in the effectiveness of magic, just what are you trying to say here?). WHAT A PRICK!!!! NEVER CAN IMAGINE WHAT WILL COME OUT OF THIS TYPE OF CRIMINAL!!!! Simply the way I like it. I experienced childhood with saltines with chicken soup… however I think Imma like it much better along these lines ???? Pinned! TECHNOLOGY RIGHT NOW 2018 ? Wondering if you couldn’t just pour the chocolate over the entire pan and then break it up into pieces? That’s what I do when I make butter toffee. I’d tried it, It tastes and looks like a salty biscuit with chocolate and nuts on top. I’ve made these before after trying them and getting the recipe from my mommy. It’s really yummy with sound crack of toffee. I just drop the chocolate chips on top of the toffee crackers when they come out of the oven. Let them sit 5 minutes and then spread with an offset spatula. Let cool and set and break apart.